In 1997, a flood at a Colorado library wiped out a recipe for a Belgian Dark Ale that New Belgium was interested in brewing. Instead of just forgetting about it or faking the recipe, New Belgium sent their brewmaster and the researcher that had originally found the recipe off to Belgium to track the original down. After much deciphering of ancient script, converting obscure measurements into something usable, and a lot of trial and error back at the brewery, 1554 was what they ended up with. 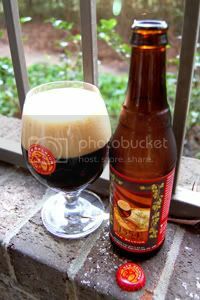 New Belgium describe 1554 as "a highly quaffable dark beer with a moderate body and mouthfeel." They list it as an "Enlightened" Black Ale, but as that's not a recognized style, I'm going with Belgian Dark Ale. Apparently, it uses "a light lager yeast strain and dark chocolaty malts to redefine what dark beer can be." An ale with lager yeast, what will they think of next? Appearance: Dark reddish-brown body with ruby highlights. The head is a couple of fingers high, tan colored, tightly-packed, and sticky. Lacing is good. Aroma: Dark roasted malt, cocoa powder, and fresh coffee with a slight bitterness. In the nose, this beer reminds me of a Porter. Taste: Very much the same as the aroma: dark malt, dark fruit, and cocoa powder tempered with a decent amount of malt acidity and hop bitterness. There's a little bit of spice mixed in, giving the beer a little Belgian flair. Despite only clocking in at 5.5% ABV, every now and then you get a pop of booze. Aftertaste is of roasty cereal and cocoa (but not Cocoa Puffs...). Mouthfeel: Silky and creamy medium-body with moderate carbonation. Drinkability: This is a somewhat slower beer, but is still light enough to allow you to run through a six-pack in an evening if you set your mind to it. Verdict: Another complex and interesting offering from New Belgium, 1554 is a roasted-malt delight with that little Belgian twist New Belgium is so famous for. If you haven't sampled 1554 yet, put it on your list of beers to try. Just came across your blog today, and I absolutely love it. I added your site as a link of interest in my blog. Check it out some time (http://necessaryevilsoflife.blogspot.com/). I mostly talk about sports and beer. Happy drinking and Happy New Year! I too am a fan of 1554. Being in an area where NB does not distribute their products I am forced to brew clone recipes of this and Fat Tire. Another favorite brew of mine is Big Sky's Moose Drool.